Christmas time was such a whirlwind. I cannot believe the mess that I created in my office/sewing room trying to get all my gifts made. I found myself moving piles of paper and fabric from one place to the next to get more room to well...make more mess. Even though I still have a couple gifts to make, I just couldn't start the new year in chaos. Sure it's just another day, but there is something psychological about it. So, I spent yesterday trying to clean up a bit. I realized that my scrap bin had not been emptied for about six months. 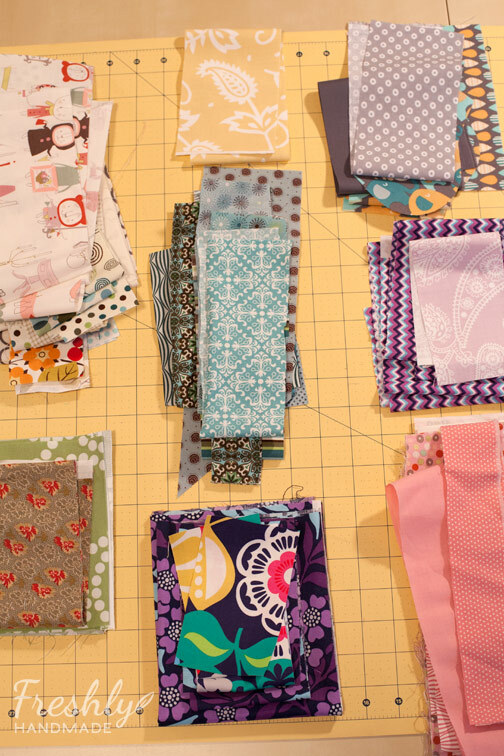 It was fun to sort the scraps by color, and along the way, reminisce about the projects created with these fabrics. 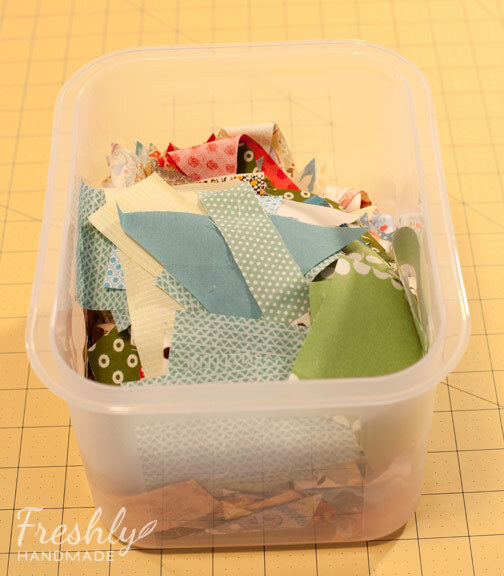 I sort the scraps by size and color and store them for future use. 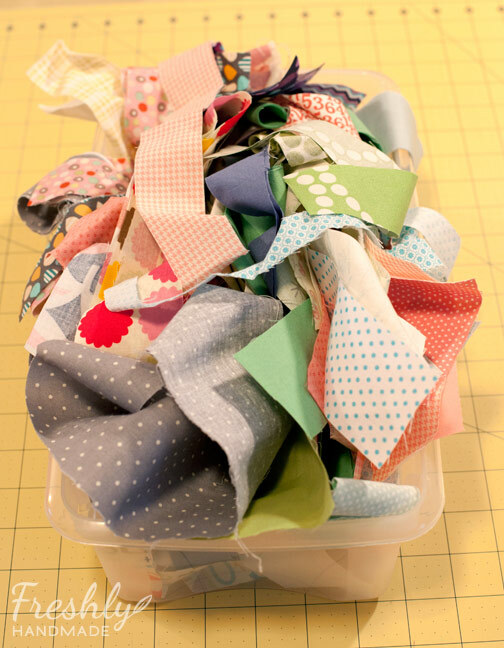 My bin of smaller pieces and snippits is starting to fill up so I might have to further sort these. 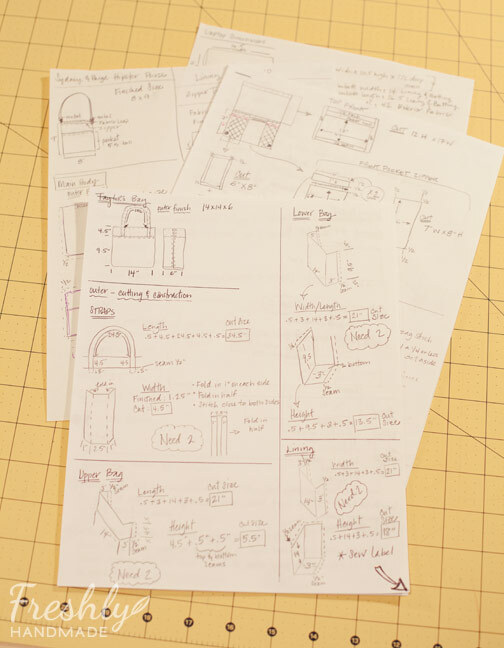 I also have piles of paper everywhere -- small reminders, notes and sketches like these. It was nice to have a little buddy to keep me company while I cleaned and organized. 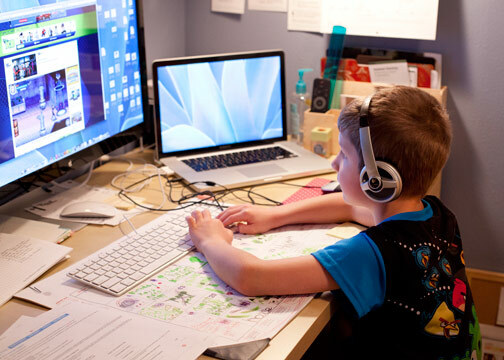 Oh my goodness, the sight of that desk makes me cringe, and that's clean compared to what it was. I love all the little doodles that the kids make on my desk calendar, so it's hard to tear it off. I still have a ways to go, but it feels good to tie up some loose ends. 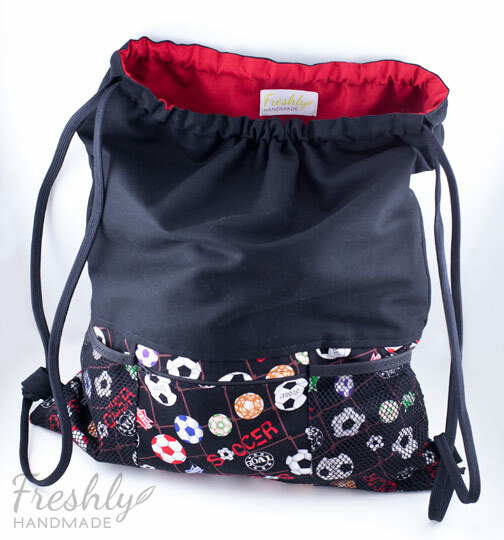 Here is the last bag that I have to share from the Freshly Handmade Christmas list. 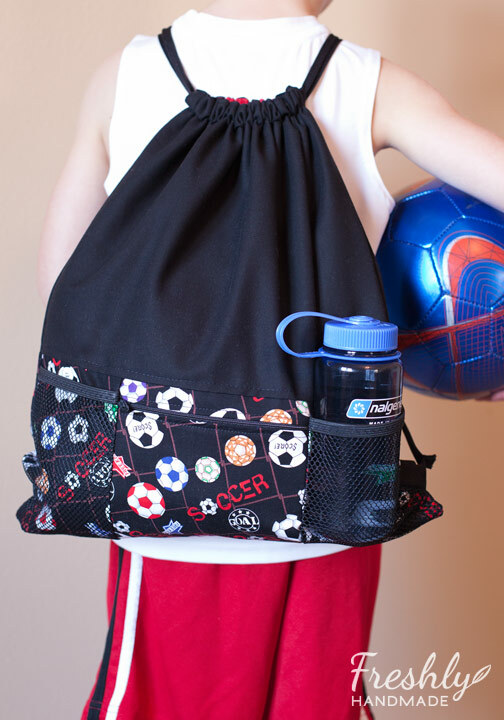 This drawstring backpack was made for my 8 yr. old nephew to carry his soccer gear. I found this tutorial from Noodlehead to get me started on basic construction, but then I made it my own to suit my nephew's needs. This backpack measures 16" W x 18" H. I used black cotton twill for the top part of the bag and a basic cotton theme print on the bottom. 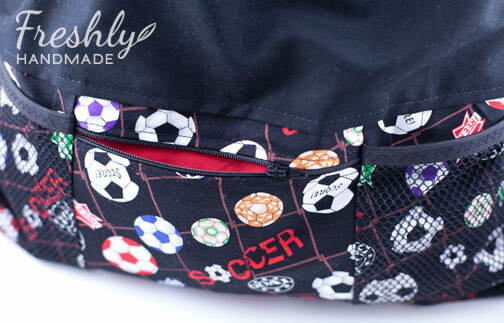 The two outside pockets are made of black mesh and folded black elastic. 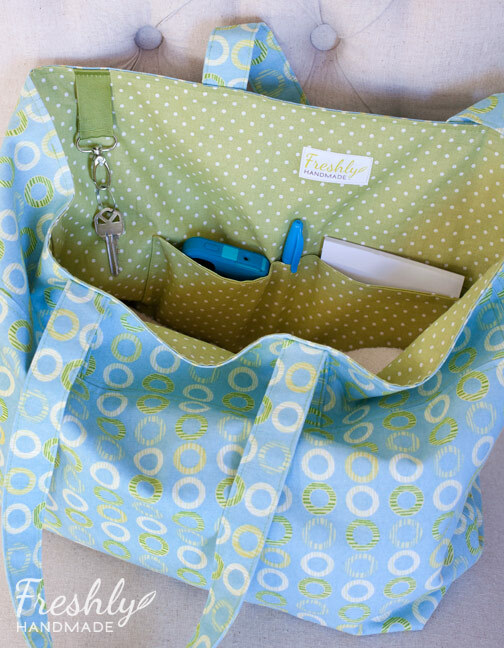 The zippered pocket in the middle is good for carrying money or house keys. The inside is lined with solid red quilting cotton, but I'd consider using a laminated cotton for carrying items that will get dirty. For the straps, I used 3/8" black lanyard cord. Well, that is the last item I have to share from the handmade Christmas list even though I am still working on a couple late gifts. I wish I was better prepared to start the new year with a clean slate of projects, but I still have two days to finish them. 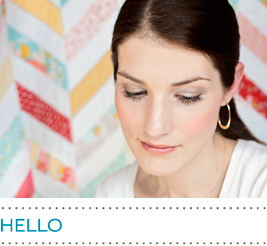 Sharing another item on the Freshly Handmade Christmas list with you today. 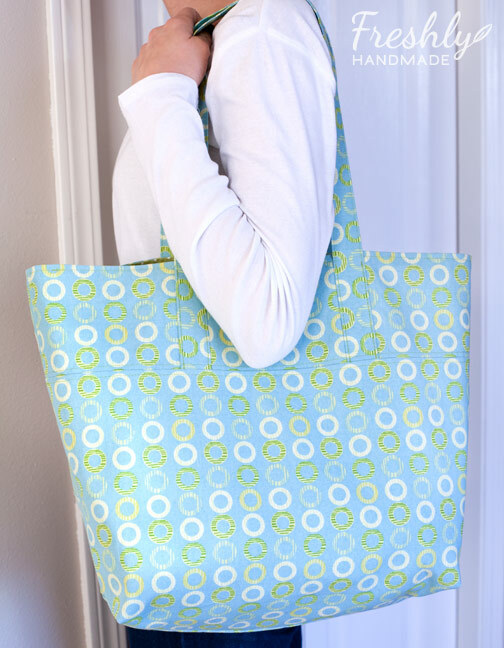 Here is the large tote bag I designed and made for my teenage niece. 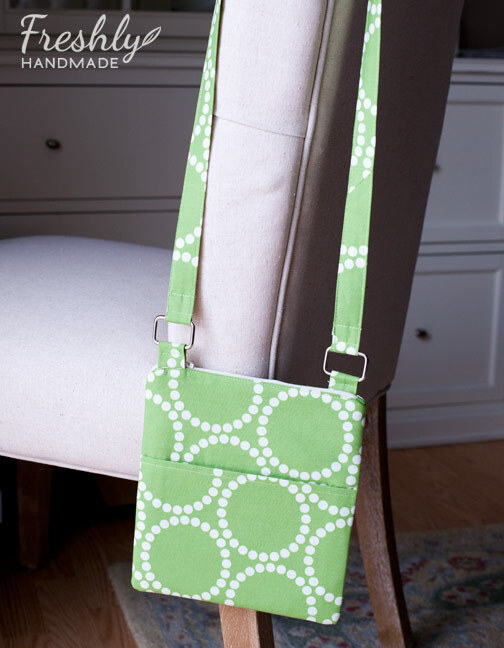 It measure approximately 14" W x 14" H x 6" D and is the perfect size for carrying all her running gear or to use as an overnight bag if staying at a friend's house. 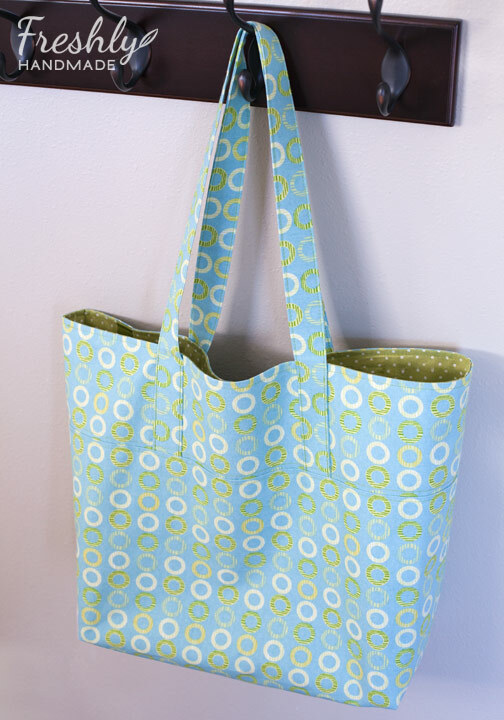 On the outside, I used a decorator-weight cotton fabric. Stitching in a contrast color shows off some of the details. 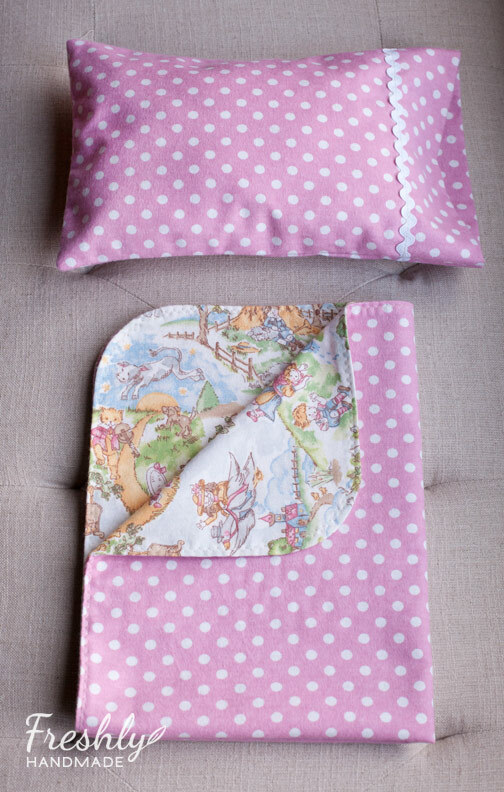 The inside is lined with a quilting cotton in polka dots (my fave). I added a few pockets for some essentials and a clasp to hold things like keys so you don't have to dig around the bottom of the bag. 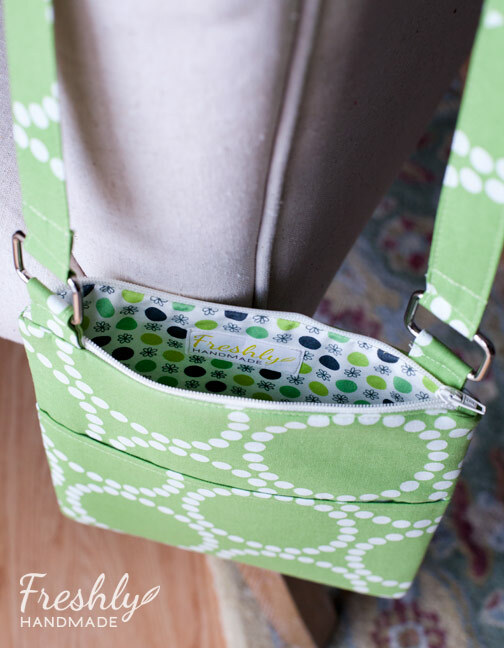 I like that the bag is flexible, but you could easily add fusible fleece or interfacing to give it more structure. 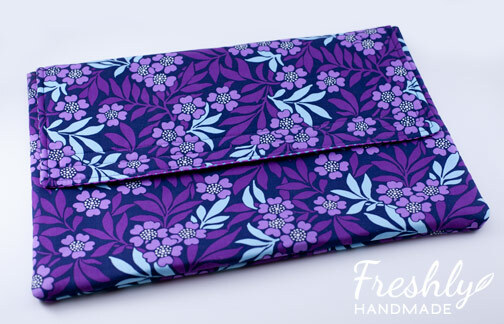 I have one more bag to share with you from the handmade Christmas list, which I will do tomorrow. I'm off to play in the snow with the kiddos. Today, I share with you the hipster purses I made for two of my nieces for Christmas. 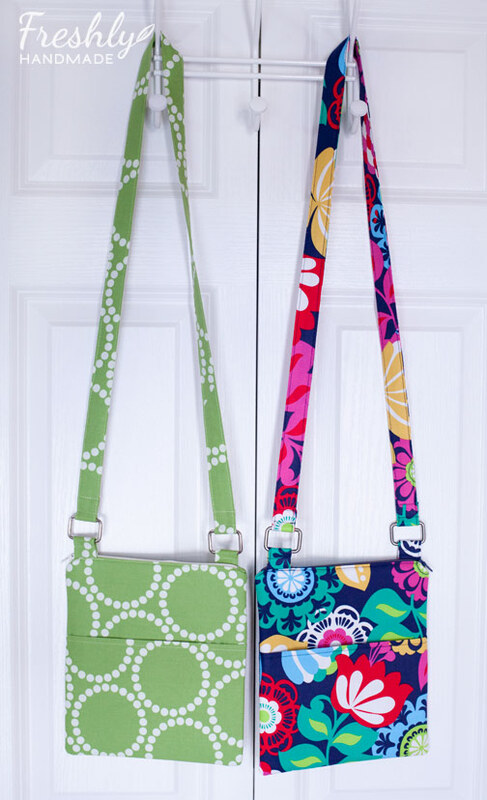 These purses are great for tweens and teens because they are small -- approx. 8" x 9". I mean, how much does an eleven year old need to carry? The long strap allows you to wear it across your body (on your hip, hence the name) for a cool look. It's all about being cool at that age, right? 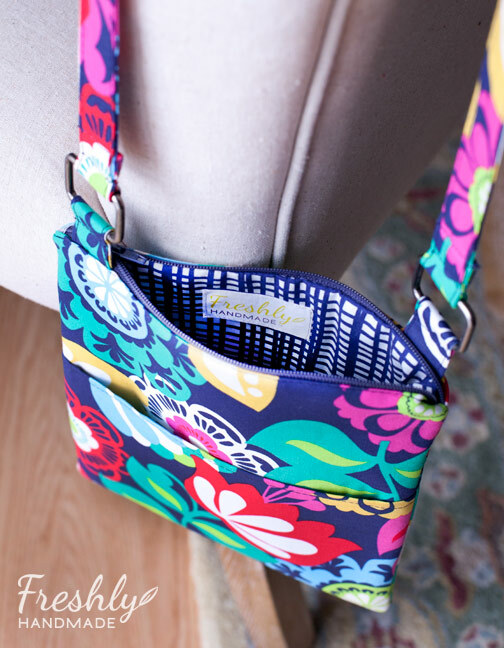 The front of the purse has a single pocket for quick grap items. Fun fabric on the inside too of course. 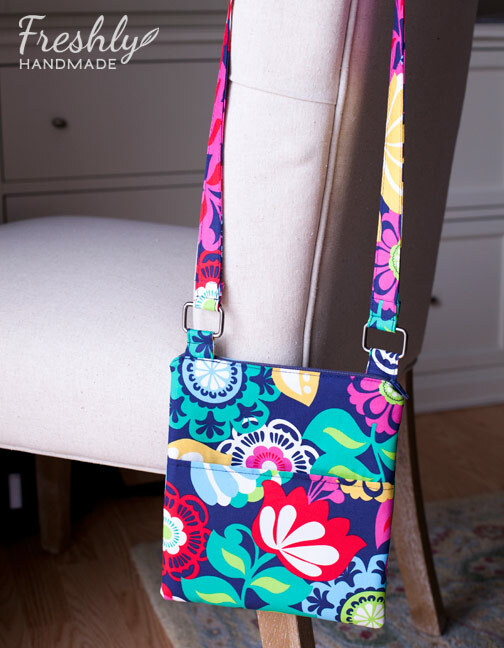 Lots of bright and bold colors make a statement. These hipster purses are actually nice for any age when you only have a few essentials to carry. I'll share more fun bags that I made as gifts over the next couple of days. I hope you all had a wonderful Christmas. I know I did. It is a relief to have the majority of my handmade gifts finished. Yes, I still have a couple yet to make, but I hope to get them done this week. I didn't get a chance to share the last number of items I completed because all my time was dedicated to sewing -- right up until the morning of my travels. I'll make sure not to do that again next year. 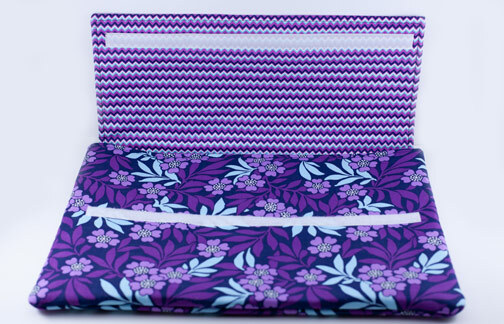 Today, I share with you the laptop case that I made for my niece. This case is for a laptop with a 17" monitor, so it is big. Unfortunately, I didn't have a laptop that big to photograph with it. 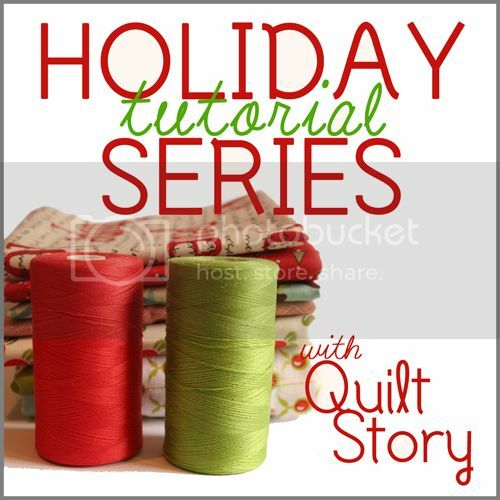 I used about a half-yard each of two coordinating cotton fabrics, sew in velcro and two layers of fusible fleece for each section. I wish I could refer you to a tutorial that I used, but I have to say that I pretty much winged this one. I was happy to see that when we put my niece's laptop in it, it fit just right. Yay! I'll share the other gifts that I made in the following days. 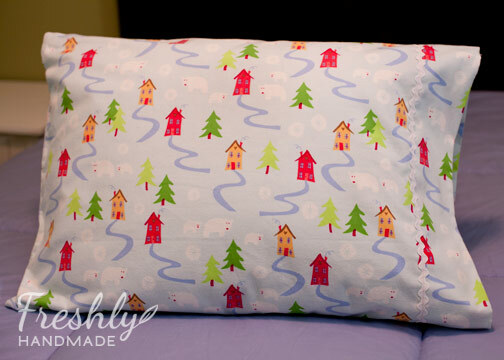 In addition to the flannel pillowcases I made my nieces for Christmas, they also will each be receiving a flannel blanket and pillow for their dolls. 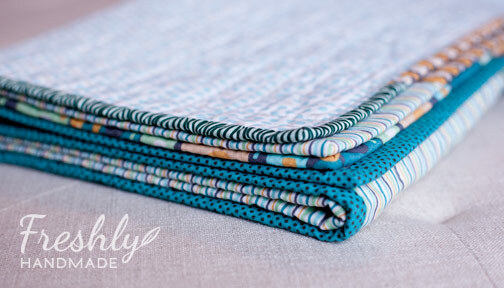 I used two different flannel prints -- polka dots and nursery rhymes -- and made reversible blankets using the same construction method I demonstrate in my lightweight baby blanket tutorial. The size of these blankets is 18" x 24". The pillowcases measure 12" x 8". I added medium white rick rack to match the standard size pillowcases I also made for them. Here is one set being put to good use. I have a feeling my daughter will be jealous and I'll be making another set. I continue to work on the handmade Christmas gifts for the family. Today I'd like to share one of the items I made for two of my nieces. 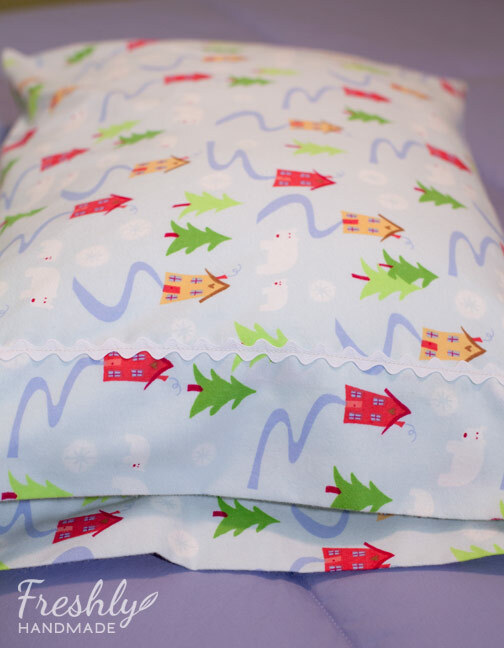 Sisters, ages 4 and 6, who share a room will be able to sleep tight with flannel pillowcases for wintertime. 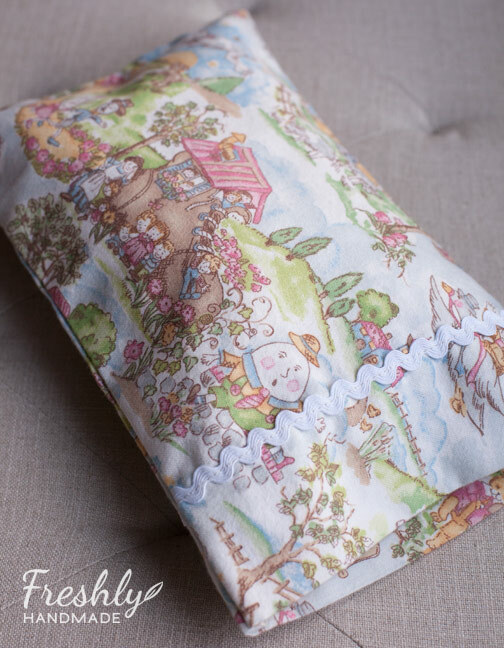 I made one for each of them in a standard pillowcase size. I added jumbo white rick rack to give them a girlie touch. This fabric design is so cute. 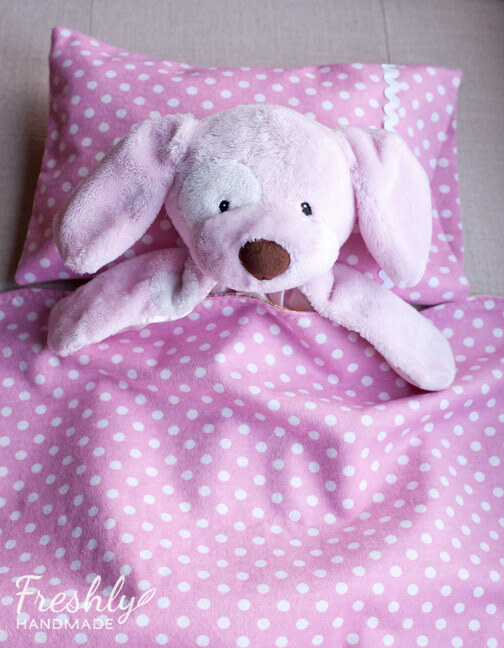 I think the girls will love the sweet touches like the heart on the house and the cute bears. I have a couple more things in store for these two girls, which I'll share when they are complete. Four more days left to sew for me and still many items to make. The kids have a snow day today, so we'll see how much I can actually accomplish. 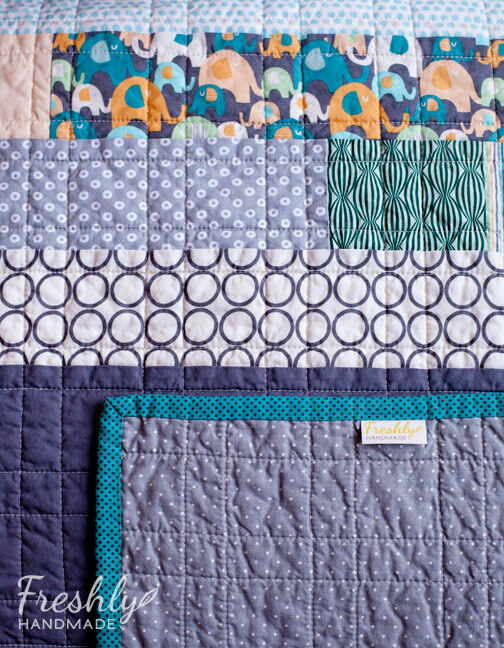 Making handmade baby gifts is one of my favorite things to create. 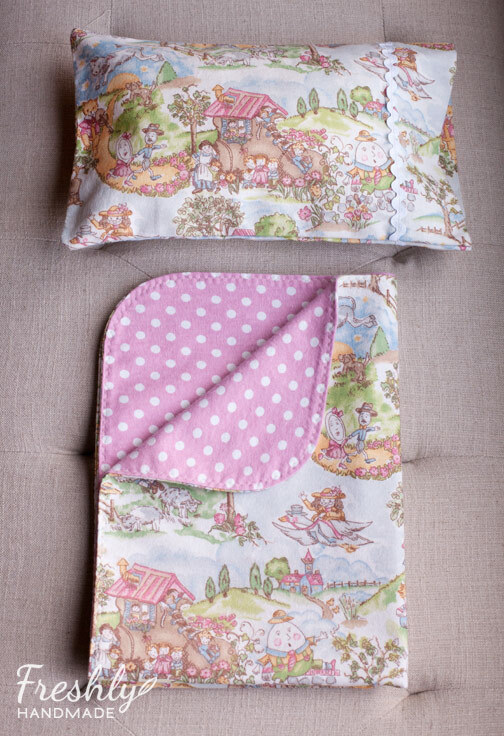 Everything from the tiny size to the precious fabrics and colors, there is just something sweet and exciting about making special gifts for new parents and their little one. We are awaiting the arrival of new baby in our family, due later this month. My brother-in-law and sister-in-law are going to be first time parents, so I wanted to make them items that I couldn't live without when my kids were babies, as well as a few keepsakes. 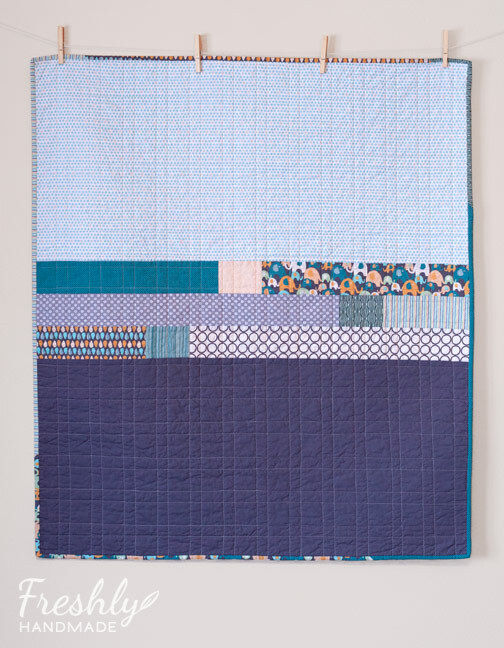 I don't know the gender of the baby so everything was created with a neutral color scheme of mostly gray, blue-greens and orange. 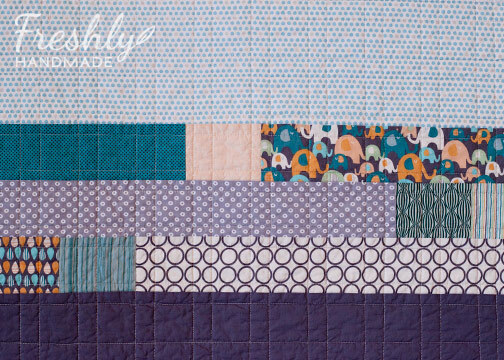 First up, this modern style quilt to snuggle up with or play on. Here is a more detailed picture of the fabrics used. As you can see, I used a variety of dots and circles, which I love and they are gender-neutral. 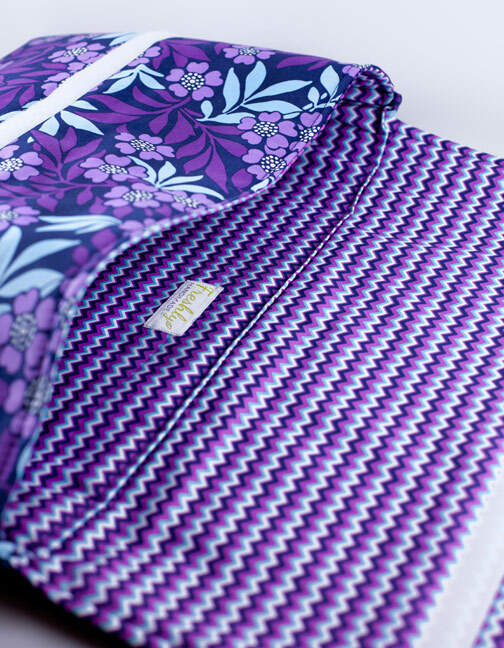 The binding was made up of a number of the fabrics used on the front which adds to the interest. 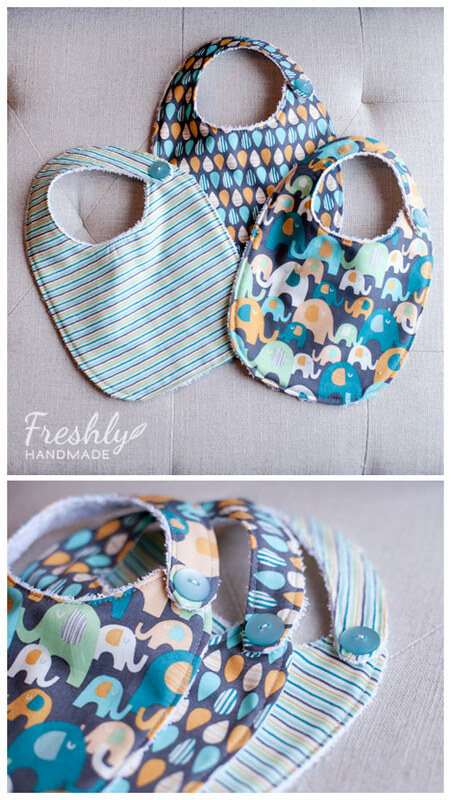 Using some of the same fabrics and terry cloth, I made these small drool bibs. I also made a set of six burps cloths that were essential to me when I had infants. 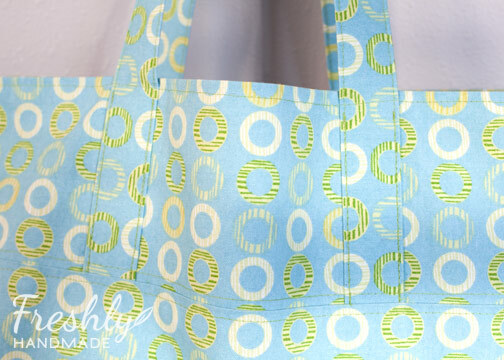 These were made with white terry cloth and bias tape in the same gray and blue-green color scheme. 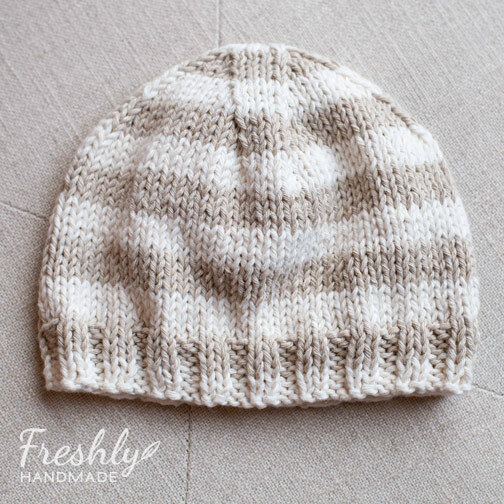 And, because I brought my knitting needles out again after a long hiatus, I wanted to make them this precious striped baby hat. 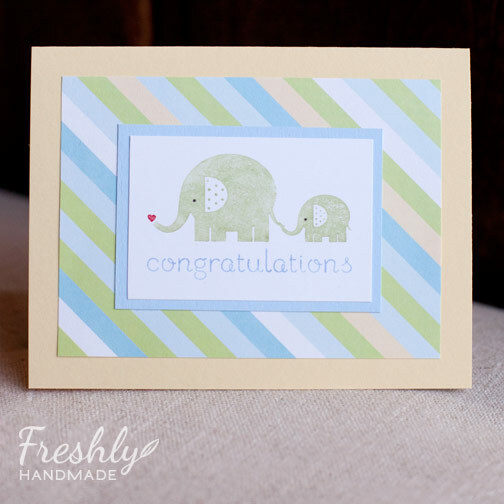 I carried on the subtle elephant theme, with a handmade card. All the gifts conveniently fit in individual boxes in sizes that created this stacked tower. 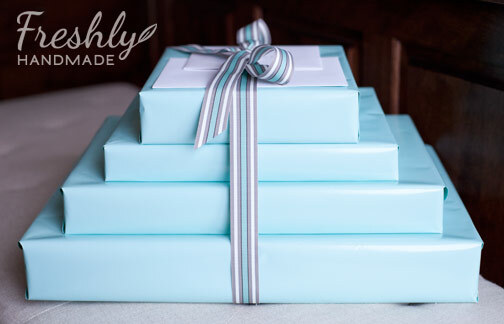 I wrapped them all up in a neutral "Tiffany blue" paper and added a striped gray, white and blue ribbon. Who wouldn't love to get this in the mail? I sent it off to the parents-to-be last week and I am happy to report that they were thrilled with the gifts. That makes me smile. I've been asked if I would share my recipe for the cut-out cookies I've featured here and here. What I like about the recipe is that the cookies are firm, yet not too hard. The icing dries just enough so that cookies can be stacked, but has more flavor than royal icing. Click the link below for a printable version. I almost always use cutters that are about 4" (medium to large). This usually produces approximately 3-4 dozen cookies depending on the shape. There are a couple holiday traditions that I can't let slip by even though I am strapped for time. Making holiday cut-out cookies is one of them. 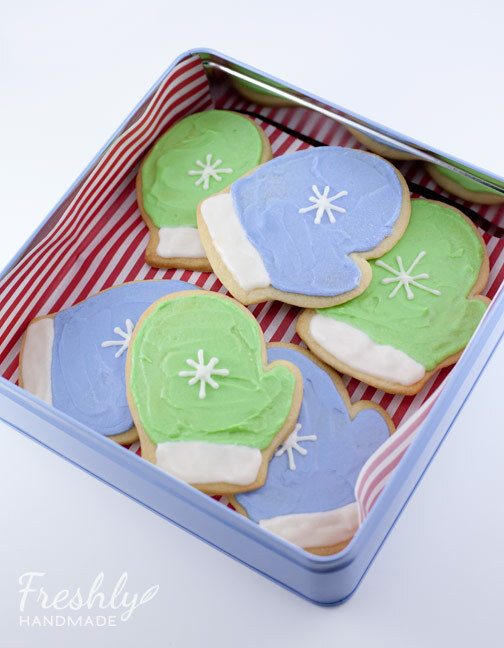 As I've mentioned before, they are my favorite cookies, but they also make great gifts as well. 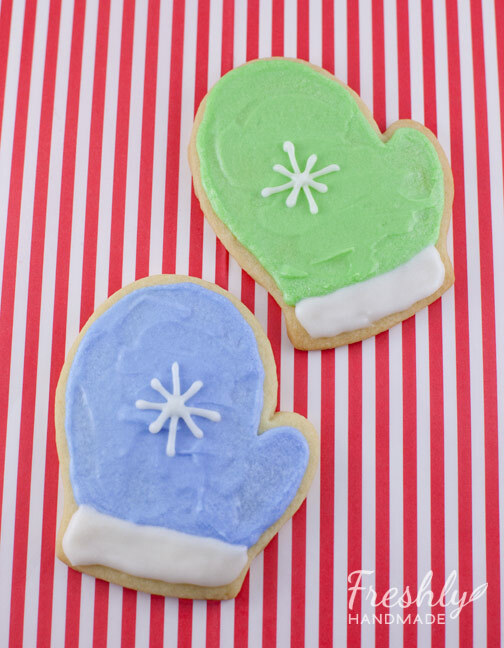 I did simplify this year by only making one shape -- these cute mitten cookies. I think the trick to these cookies is finding the right balance between pretty, sturdy and yummy. I've had some beautifully decorated cookies that don't taste so good. Lots of time the frosting, or royal icing in some cases, is rock hard. Sure, it makes for a smooth finish, but it's not quite so tasty. 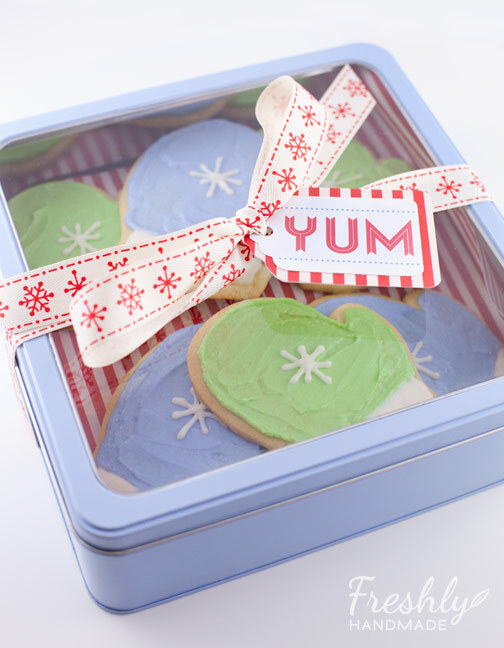 Creating the packaging is just as much fun as making the cookies. I found this tin at Jo-Ann craft store. Not only do I love the the color, but I love that it has a clear top so you can see the contents. With the addition of decorative parchment paper, some pretty ribbon and a simple tag, I've got a great handmade gift to give. What are your holiday baking traditions?